The alarm had woken me up at 5:00am. I did not sleep well: Sunday night noises of civilization (cars and people passing by) had been too loud for a sound sleep. Unfortunately, no morning coffee was available -- and I desperately needed some caffeine: this was my third night in a row with very little sleep. Started the day with a bagel & cheese, and an orange, followed by a few sips of cold water. Broke the camp and packed everything up; it was not difficult -- the street lights were still on, and so far no rain! The tide was probably at its lowest: the nice flat and reclined launch area that I selected last afternoon was completely dry and high above the water: to try departing in the next few hours, I would have had to go beyond it and load my kayak staying up to my waist in water, among large submerged rocks. For now, I had assembled my kayak and moved my stuffed up dry bags close to the launch area. Then the rain had begun: not a drizzle -- a good solid rain. Wearing a full kayaking outfit I was dry; however, I had to turn my kayak upside down: it was visibly filling up. Then I had retreated to the visitor office area waiting for the rain to subside. In any case, it was still early to try loading and launching the kayak at such a low tide. Unlike me, ravens did not mind the rain, snacking up on fish leftovers. The band store had opened at 9:00am, and I went inside, more to pass the time than to find anything for my trip. Half an hour later, I was back at my kayak, searching for my sponge to dry it up inside. Then I realized that I had forgotten my kayaking sponge at home: I now had to come up with some substitute for this useful tool. Back to the store: no sponges were available there. With help from a store attendant I had settled on a three-piece pack of cotton tea towels. While there, also bought a package of pressed dates. Later that day, I had tried them for a snack and realized how good these dates were, and regretted not buying more. On a way back to my kayak I saw a couple coming to the store: one face definitely looked familiar. What a small world it was! This was a young teacher whom I met last Fall in Victoria, with her boyfriend. Apparently, they had arrived to Klemtu recently: she got a one-year teaching job. I had noticed that the day before several people in Klemtu had very respectfully asked me if I was a new teacher. I had to disappoint them, but I now knew who at least one new teacher was: the kids were going to be in good hands. As I was planning to depart shortly, I had to decline a kind invitation to stay at their cottage overnight. The tide was rising, the rain had stopped: I got my kayak on water, loaded it up and departed at 12:30pm. Despite the delay, the timing was still good: I had about two hours to take advantage of the flooding tide taking me to Meyers Passage entrance. Then the tide would turn to ebb pushing me again in the right direction, through Meyers Passage where currents could reach up to several knots. 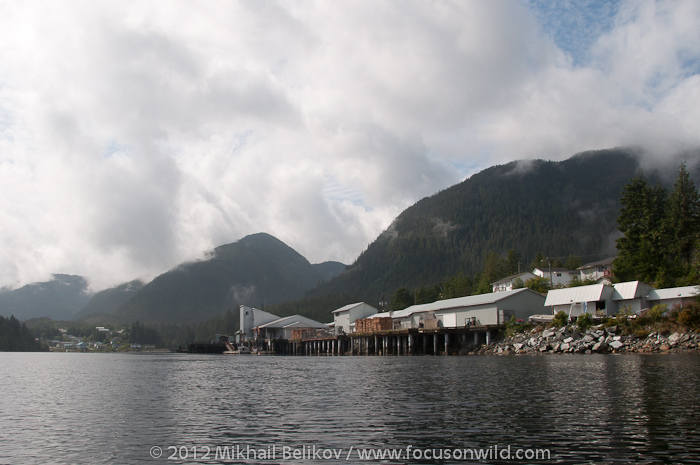 In a few moments I was already passing the fish factory; turning back, I could see Klemtu harbour and houses. As usual, the first day inside my kayak was a bit uncomfortable. It was stuffed up with food for my journey, and I had a very little space left for my legs. When seating inside, my knees were almost touching my chest. Based on my previous expeditions, I knew that in a week or so the space inside would become quite plentiful, and in a couple of weeks I would even have to deliberately fill in the increasing empty space in front in a way that I could have some support for my feet while paddling. About 30 minutes after my departure, I saw a large structure on the shore: this was likely the new ferry terminal, 2 km away from the town, a place where large ferries could dock. The tides held, and I had no problems getting to Meyers Passage entrance. 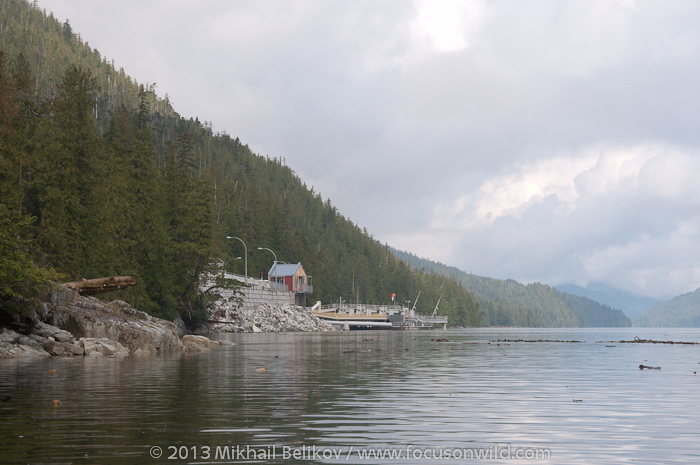 Some fishing boats were passing by, likely from Klemtu. 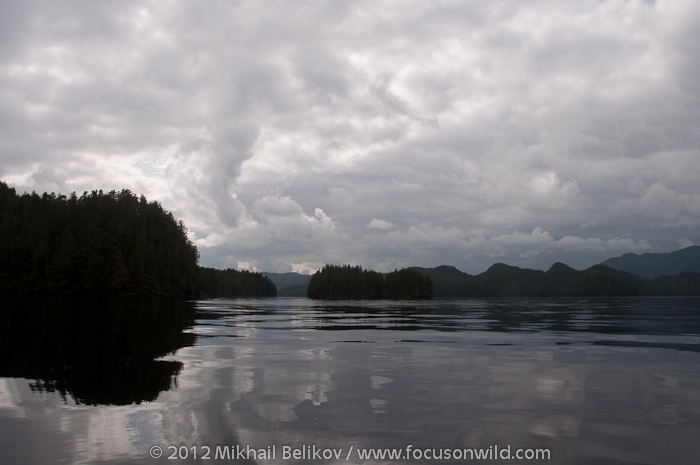 After turning into the passage, I had to stop and photograph the calm waters and the sky looking like a painting. This was the slack time and so no visible current in the passage. However, within an hour a front wind had built up small but unpleasant waves: both were slowing down my progress. More troublesome, the lack of sleep over past three nights was taking its toll: I had realized that I was falling asleep while paddling. There was no place along the shore to stop for a nap, and so I had to press on. After a while, I had started catching myself seriously thinking (or dreaming?) that I would tie up the kayak to an overhung branch and snooze for an hour while afloat: what a foolish idea! It was clear that I needed to find a campsite soon. At this point, I had two options described in the guidebook: a small sandy area about 30 minutes away and a large well established campsite on high grounds further down, at a point where the passage bent like an elbow, at least an additional hour of paddling. I would have preferred to push today as far as I could. However, I felt that I could probably stay awake for 30 minutes more, definitely not for an hour and a half! The decision had been made and I continued my journey looking for a little sandy spot on the left shore ahead. I had found it half an hour later: a small beach behind an islet. Once close to the shore, the place appealed to me right away: a beautiful tiny sandy beach with flowers and red berries visible on nearby bushes. 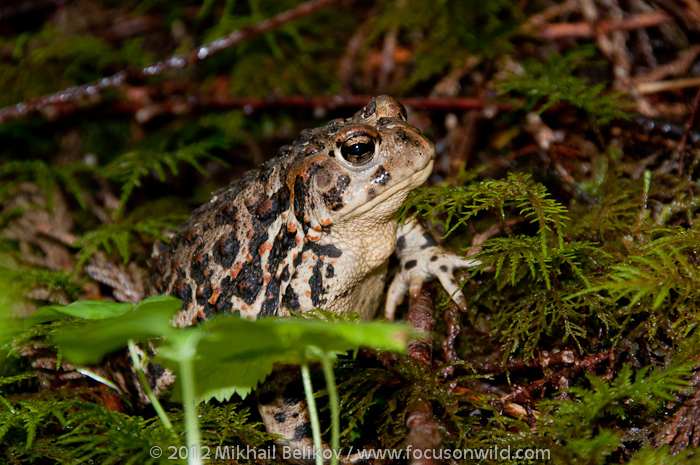 I had stepped ashore and immediately came face to face with my first wildlife subject on this trip: a western toad. After taking a few pictures of this timid animal and even recording a short video, I let it go its way and returned to my kayak. There was a small leveled space on the beach for a tent, very likely flooded at spring tides. Pitched the tent and got a couple of hours of a desperately needed nap. There were still two hours of daylight left when I woke up, and I went fishing but did not catch anything. Same as on my previous trips, catching fish was essential for eating well. With a limited space inside my kayak, I could not carry a full supply of food for a multi-week trip. Fish, mushrooms and berries had supplemented my diet in past. Back to my camp, I had collected fresh water from a nearby stream and cooked my first camp meal. With no fish available, I had to open a small can of meat. By the time I was done with my dinner and had filled up my thermos with a strong coffee for breakfast, it was already quite late. However, there was no rush go to bed: I could sleep until 10:00am next morning. To continue through the passage, I had to wait for tide to start ebbing after 1:00pm. Tomorrow, I was hoping to reach a campsite on Milne Island recommended in the guidebook: a good overnight stop some ten nautical miles away from my present camp, close to Laredo Inlet entrance.